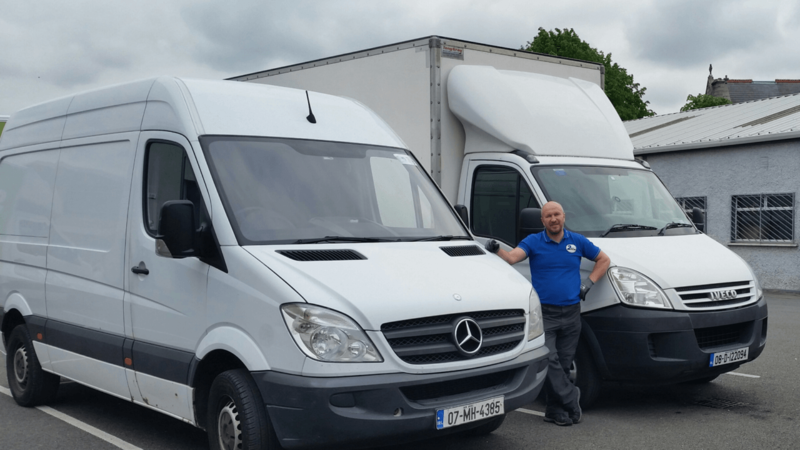 We are a dedicated removals company based in Dublin, Ireland. In the removals business for over a decade now, we are known for our excellent service as well as reasonable prices. Feel free to contact us for any removal job — whether moving home, business, delivery, packing, clearance etc. No job is too big or small! Hire our service for a smooth & efficient house move. Van and driver available anytime for any size of job. Experienced, professional service for any heavy jobs. Experienced movers to transport your piano with care. Furniture moving and delivery to any part of Ireland. Popular, low-cost crate hire - delivery & collection. Always a pleasure to deal with Remi. An honest, professional service, I'd recommend to anyone. Fantastic service (reliable, quick, great price)! This is not the first time I am using this kind of a service and so far prooved the best in Dublin. We recently used Remi and team to move house in South Dublin. We personally found the guys very professional and excellent to deal with. We would have no hesitation in recommending them based on our experience. Fantastic and professional service. I'm absolutely delighted and amazed how fast everything went! the best service in Ireland!!! Thank you so much for everything! Fast and high-quality work for an adequate price, definitely recommend! I hired Remi to move a Piano from Tipperary to Meath. I found his service to be excellent. Excellent communication and very efficient. Also his price was value for money. Highly Recommend this Company. Efficient, professional and friendly.Thank you! We moved house today and got 2Men2Vans to help us.. They are amazing! They go the extra mile to make it easy for their clients. Would recommend them to anyone. Thanks guys for your hard work! Very punctual, incredibly efficient and very friendly. Thanks guys! This is a super removal service provided by Remi. He and his colleague were very efficient and hard working. We are happy to recommend them without reservation. Great service, helped us out on short notice after other mover bailed on us. Great service! If needed I'll definitely will use it again. Highly recommended! Had to pull off an urgent house move and 2men2vans came through with a last second crate rental and house move. The entire process was very efficient and blazing fast! This was my second time using the service and I will continue to preach 2men2vans to others who need to move house. Always a consistent and excellent service from Remi and the team. Very easy going and would always recommend them to everyone. Quick and reliable professional services. I Have used twice and would use again. These guys are just amazing. Remi runs a super efficient business and we couldn't have been happier with the work. It was a last minute move and we weren't even finished packing; there were furniture pieces to be dismantled and then reassembled, there were things to be dropped in 3 different areas including storage and they did it all with infinite patience. Will definitely use them again and absolutely recommend 2men2vans! Excellent. Couldn't rate them highly enough. The quickest and most efficient move we have ever had. Would highly recommend them. Good service, been using same company for close to 10 years now. Available on short notice after other mover bailed on us last minute. Excellent service! Really helpful, reliable, friendly service. I'll Defo be calling on Remi again and recommending him to all. Amazing service!! They are very precise, careful and honest. Can't thank them enough for their kind service during the stressful period of the move. Absolutely fantastic, have used them three times already. Very fast and organised, taking great care of my things. Also very affordable considering how quickly and well they work. Fantastic service (reliable, quick, great price)! This is not the first time I am using this kind of a service and so far prooved the best in Dublin. I highly recommend you! Thanks, Remi!